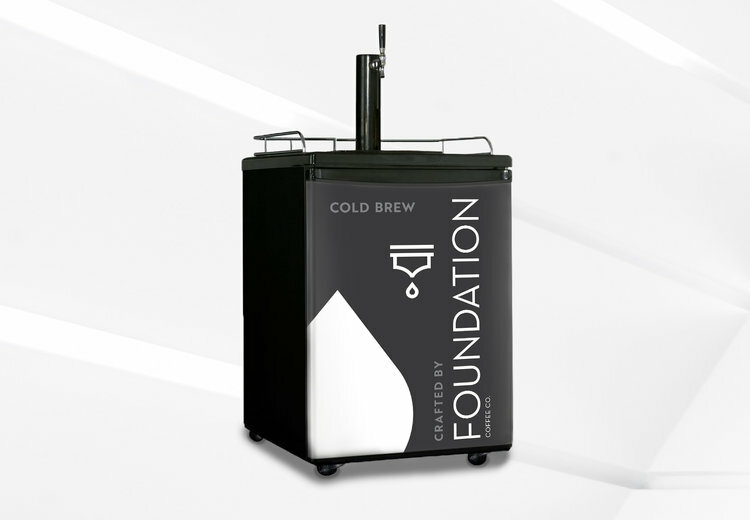 Purchase a Keg — Foundation Coffee Co.
Own your own Foundation kegerator and enjoy fresh, delicious cold brew every day. Shelf Life - Any leftover coffee should be disposed of and optionally refilled on a monthly basis. Set-Up (+$75) - Have one of our certified techs setup your cold brew system. Custom Tap Handle (+ $85) - If you would like a custom tap, please select the customization add-on option along with your keg at time of order, then submit your logo file(s) to orders@foundationcoffeeco.com. Nitrogen Tank (+$110) - Needed for both cold brew and nitro coffee to come through the tap properly, nitrogen is the “push” that feeds our coffee through the keg and tap handle. CO2 is not used as it spoils the coffee. Price includes first fill, refills are $25 each (billed at time of service). Cold Brew Kit (+$249) - Package includes delivery, a nitrogen tank, and first nitrogen fill. Refills are $25 and billed at time of service. Nitro Brew Kit (+$349) - Package includes Delivery; Nitrogen reguator; Stout faucet; Nitrogen tank; Quick cascade lid; .5 High-pressure carbonating stone. Refills are $25 and billed at time of service. To add a personalized touch to your Cold Brew / Nitro Brew system, ask your wholesale representative about custom cups, growlers, and other merchandise. When would you like your keg delivered? Would you like any of the following add-ons with your order? If you opt for a custom tap handle, please submit your logo file(s) to orders@foundationcoffeeco.com. Are you using this product for resale? If yes, please provide Business Tax ID Number. If you do not have access to your company's tax ID number at this time, please contact us at orders@foundationcoffeeco.com to submit prior to delivery. State Tax will be charged until ID number is submitted and processed. Thank you for ordering from Foundation! We will be in contact to confirm your order, and deliver an invoice to your inbox within 48 business hours.